Originally from south of France, Nicolas was raised in a family of food lovers, where everything is made in house, from the garden to ’charcuterie’. Nicolas life is a terrestrial globe, he was born in Congo and grew up in western Africa, Mauritania and Togo after his parents were sent there for work. Back in France as a teenager Nicolas graduated from the renowned Culinary Institute in Burgundy, Chateau Chinon, at the age of 17. During the second year of his study, he also attended trainings in a prestigious Michelin Star establishments. He also entered into the final of the Best Apprentice of France in 1991. He started his career in a 2-Michelin Star restaurant, "La Barbacane Restaurant", in Southwest of France, working under the charismatic Chef Michel Del Burgo. After 2 years, he moved to Belgium where he worked for another 1-Michelin Star restaurant, "La Cusine Des Anges”. 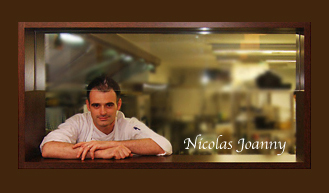 Like many young and promising chefs, Nicolas moved to the city of Paris for 4 years. In Paris, he worked in the top-notched restaurants like Taillevent (3-Michelin Star) and Le Vivarois (2-Michelin Star). He was later selected to be one of the private chefs of the ex-French Prime Minister, Mr. Alain Juppe. In 1997, Nicolas took up a great challenge; he went to work under the 2- Michelin Star chef Antony Genovese "The Palazzo Sasso", a newly opened boutique hotel in Southern Italy. Knowing that the time was right for him to become a Chef De Cuisine and with his interest in Asia country, Nicolas moved to "The Duxton Hotel" in Singapore the famous boutique property in Singapore. There Nicolas’ style of cuisine was very well-received, he was time to open his own restaurant, Nicolas Le Restaurant opened up in the heart of Chinatown Keong Saik Road in 2007, before moving to Teck Lim Road in 2012. Nicolas’s style of cuisine is traditionally French with great usage of products from France and Japan mainly, little cream and just natural jus and emulsion. He understands and respects the natural flavors of each ingredient that he uses to create traditional seasonally changing French menu.